Hello and welcome from Germany. I am on holiday, finally! Everything is good. Although the journey so far has been not exactly smooth. Our plane trip was delayed by 2 hours (not cool if you wake up at 4am with two small children in tow). We got a smaller plane than planned, that would not get us through to Germany in one go, and we had to pit-stop in Turkey for a fuel stop. We finally reached Germany after 9 1/2 hours (we were supposed to reach after 6 hours). The food was inedible and simply not enough for 9 1/2 hour journey. This small plane only had two washrooms that were by far not enough to cater for people using them for 9 hours.Well, somehow even these days pass and soon after they were forgotten. Although we still plan to write a nasty letter to the airline, one fine evening over a good glass of wine. But the next obstacle was just waiting around the corner: one day into our Germany vacation, after a not very healthy take-away dinner, I got seriously sick and was flat on my back in the bed or somewhere around the toilet for a whole day. I am not sure if it was food poisoning or if the dinner coincided with getting a stomach bug. I feel better today, although I still don’t really want to eat much or anything other than porridge. And whatever junk food I had for dinner that night, I will never ever have again in my life. Feeling so miserable put me off for the rest of my life. Today, we drove to our holiday house at the seaside in St. Peter Ording. I booked this for us in January. Hey, why should it go smoothly…. the house and its surroundings looked lovely. But then, the keys for the house were not in the spot, were they were supposed to be hidden. Thank God, it was just a minor incident. We could just count on German reliability and keys were delivered to our doorstep within 15 minutes. If there is anything elseto complain about, then it will be me sitting almost on the roof of our house to get Internet connection. That’s it so far. Loving the German fresh air, the rain, the breeze, the kids running around on real green meadows and forests. Tomorrow we will check out the sea. I should actually give you my recipe for my porridge today, as I have been eating nothing else for the last 2 days. My kids love it for breakfast. I will take some pictures of it in the next few days and then share it with you. It is my all-healing hospital food, my kids’ favorite breakfast, and simply a good breakfast choice. Instead, I will give you my latest summer dip recipe today. From the amount of chickpea recipes on my blog, you might get the impression that I am addicted to them. You might be right. This chickpea dip is freshened up with cucumbers, and gets a good twist by adding fresh basil. Good to eat with crackers, breadsticks, or veggie sticks. Bon appetit. * The basil flavor can be quite overpowering when you keep the dip in the fridge overnight. Use 1/4 cup basil when you want to serve the dip the next day, and 1/2 cup when you serve the dip immediately. 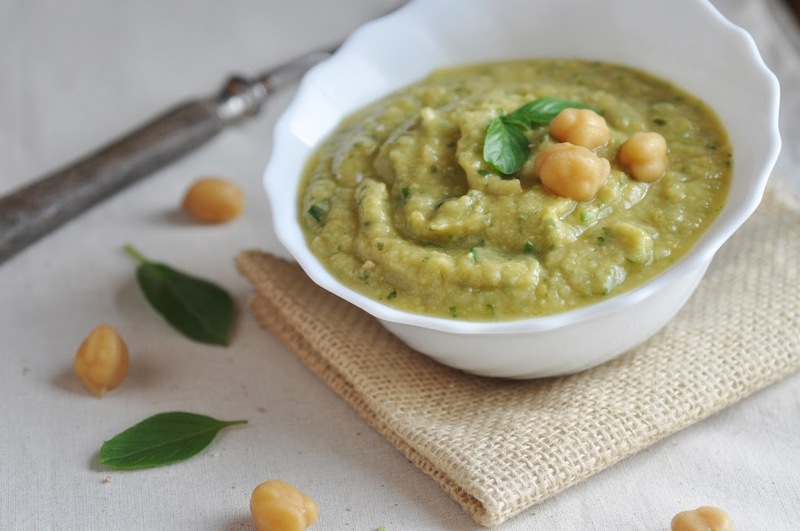 In a food processor combine chickpeas, garlic, lemon juice, olive oil and washed basil leaves. Blend until smooth. Roughly chop the deseeded cucumber, then add to the chickpea mix, and pulse again, until cucumbers are finely chopped. They should keep a little texture. If the mixture seems to dry, add some of the retained chickpea liquid. Season with salt and pepper. Serve immediately or keep in airtight container in the fridge.